What is the origin of the heat energy erupting from Earth's surface? Earth formed by accretion from solar nebula — an interstellar cloud of dust, hydrogen, helium and other ionized gases — about 4,540,000,000 years ago. Extreme volcanism and collisions with other bodies made much of the nascent planet's surface molten. Volcanic gases formed a fledgling atmosphere. As the planet cooled, it formed a solid crust. Rocks in the core and mantle remain hot from the original materials colliding at high speeds. Magma refers to molten rock still underground. If molten rock erupts onto the surface, it is called lava. Lava is liquified rock at 1,292 to 2,192 °F (700 to 1,200 °C). Collision energy is the source of heat trapped below Earth's crust. Heat below Earth's crust is called geothermal energy. May not subterraneous fire be considered as the great plough which Nature makes use of to turn up the bowels of the earth? 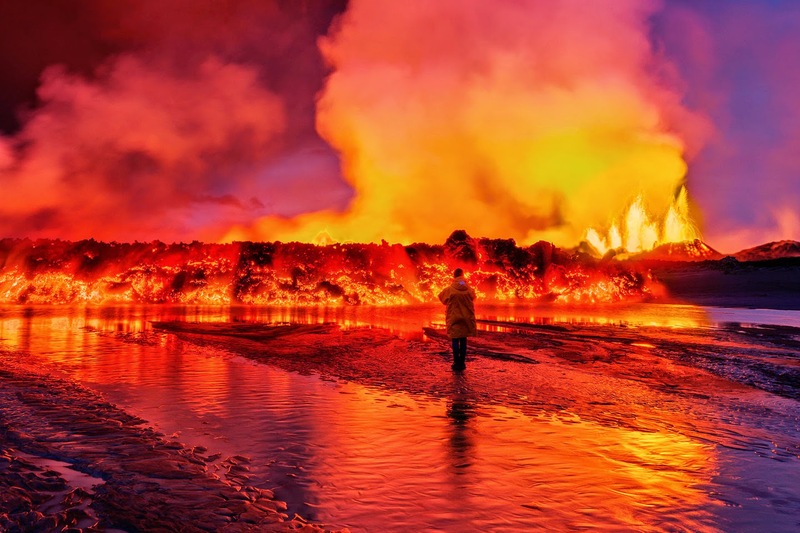 11 Photos of Iceland's Bardarbunga Volcano Erupting That Are Just Unreal, Mashable, 12 Sep 2014. How is lava formed, Oregon State University Volcano World.